How Far is JMR Enclave? 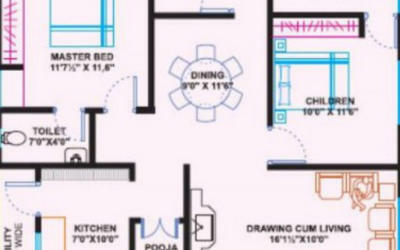 JMR Enclave is coming up with beautiful flats having abundant space and soothing interiors. Each apartment is being built with choicest floorings and fittings. These elegant apartments are coming up for those who needs everything best in their life. Offered in a range of 2 BHK and 3 BHK, these are built with top branded floorings and fittings. Internal walls with Birla wall care or equivalent smooth finish. Teak wood frame and shutter polished with hardware of reputed Make. Teakwood frames and flush shutters self designed with enamel paint and Standard fittings . UPVC windows fitted with float glass,Standard hardware, safety grills. Vitrified Tiles 2'-0"X 2'-0" size. Granite platform with sink, granite tiles Dado up to 3'-0" height with provision for municipal and bore water connection. E.W.C./I.W.C., Parry ware/ Hindware or equivalent quality in each toilet and 6'-6" height glazed tiles for walls,antiskid ceramic tiles for toilets flooring and wash(UTY)area. Birla wall care(Luppum) finishing with royal emulsion for interior and apex or dulex for exterior. Concealed copper wiring in conduits for lights,fans ,phone and T.V.plug points wherever necessary with Modular switches of ABB, Havells, Finolex or equivalent make. Fittings of JAQUAR/ESSESS or equivalent make. For lift & common lights, three to four points into the flat. Parking space for car will be provided at extra cost.